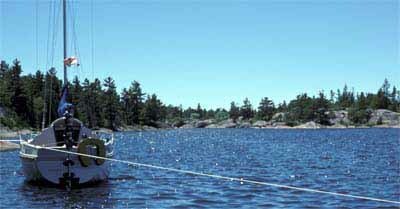 The Inside Passage, as it is known, is a marked channel that runs the whole way up Georgian Bay from Midland to the Bustard Islands. It is a very interesting trip though it takes at least three days and more like five. Most of it can be sailed with the right winds but you do have to alter course continuously following the markers. 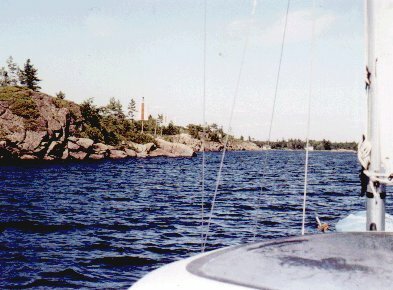 Navigation is critical as there are rocks just below the surface quite close to the channel in many places. An error could easily be disastrous so you have to know exactly where you are and follow the charts meticulously. Much of the route is in sheltered waters but there are many exposed stretches as well so you should allow some layover days. Much of the navigation is done using ranges set up on the islands which should be lined up carefully. A good pair of binoculars to find the ranges is a good idea. Anchorages for the night are easy to find all along the route - getting into protected areas may require some careful navigation but apart from the rocks here and there it is generally deep water. The scenery along the whole route is magnificent. Evenings are usually very quiet with the scent of pine trees in the air. Ideally, if you do the Inside Passage you should allow lots of time (10 days to two weeks) as it would be a shame to have to rush it. You can of course do any section of it as access to the lake is available all along the route.